any anemia in which the average size of circulating erythrocytes is smaller than normal, that is, the mean corpuscular volume is 80 mcm3 or less (normal range, 82-92 mcm3). a hematologic disorder characterized by abnormally small erythrocytes, usually associated with iron deficiency anemia, thalassemia, or anemia of chronic inflammation. Compare macrocytic anemia. Any anemia in which the average size of circulating erythrocytes is smaller than normal, i.e., the mean corpuscular volume is 80 mcm3 or less (normal range, 82-92 μm3). G] for newly described erythrocyte parameters, such as microcytic anemia factor, mean sphered cell volume, or red cell size factor, were less than 5%, except for LHD, which showed greater intraindividual and interindividual variations (Table 1). One week later, she was hospitalized for severe, persistent microcytic anemia with prominent basophilic stippling that was not improving with iron supplementation. Any patient with atypical microcytic anemia should be evaluated for chronic conditions such as plastic anemia, which is a rare complication of NSAID use. This in vivo study examined the effect of FG-2216 on gene expression and on hematologic outcomes in a rat model of ACD in which systemic inflammation induces a severe, acute anemia, which is followed by a protracted, mild to moderate microcytic anemia. Laboratory investigations revealed microcytic anemia with a C-reactive protein level of 13 mg/L (reference value <5 mg/L) and a total serum IgM of 13.
a thalassemia carriers carrying single-copy deletion of the globin gene are clinically presented with a very mild hypo chromic microcytic anemia. Serum Iron and Total iron binding capacity (TIBC was performed on semi-automated spectrophotometer (Chem 7) in patients with hypochromic microcytic anemia. The differences in values of MCV, MCH and MCHC in hemolytic and microcytic anemia are insignificant (p>0. Lab work revealed microcytic anemia with a hemoglobin count of 5. Peripheral blood examination showed hypochromic microcytic anemia, anisocytosis, and target cells. Microcytic anemia includes iron deficiency anemia, in which RBCs appear to be paler (hypochromic) and smaller than normal because of the failure to incorporate adequate amounts of hemoglobin (Hb) into RBCs. 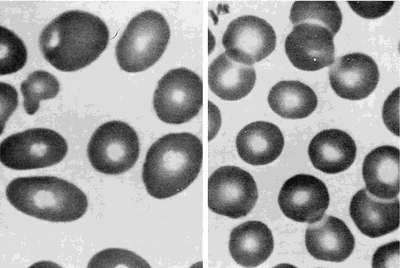 Microcytic anemia was observed in 24% of the patients studied (Clark, 1998).